I enjoyed a fabulous test sail aboard Bavaria’s old Cruiser 45 five years ago off Grenada, and came away impressed both with the boat’s performance and its accommodations. 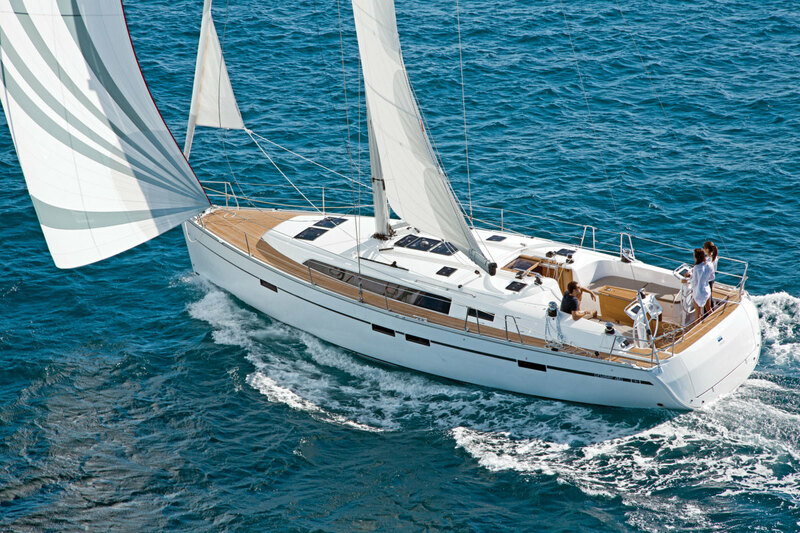 I was intrigued, therefore, when I learned that Bavaria had updated and recreated the 45 as the new Cruiser 46 and looked forward to comparing it with its predecessor after it debuted in late 2014. To add strength, the hull is stiffened with an inner grid. The cast iron keel is secured with 20mm stainless steel bolts and Plexus adhesive. The deck, also cored with Airex, is bedded in polyurethane sealant on a 3¼in flange and is screwed down at 8in intervals. Functionally the Cruiser 46’s deck is very similar to the 45’s, and the biggest difference is aesthetic. Gone are the concave cabinhouse sides that gave the 45 a distinctive, somewhat eccentric appearance. The new configuration is subtler, much sleeker and nicely complements the high-sided, short-ended hull. As on the old boat, the twin helm stations are right aft, poised in front of an enormous electrically-controlled fold-down transom. There are also a pair of clever flip-up foot cleats to keep you standing upright when steering, and visibility forward from either helm is good. The standard Lewmar Evo winches on our test boat were a tad undersized, but there is plenty of room on the cockpit coamings to upgrade to larger winches and install secondaries if you like. Control lines, including the lines from the split twin-mainsheet bridle, are led aft to an array of Spinlock XTS clutches on the coachroof. Ergonomics are very good, with high coamings to support your back when seated and a strong fixed cockpit table with folding leaves to brace against when the boat is heeling. Storage is also good, with two large, albeit shallow, under-seat cockpit lockers and a huge lazarette aft. Forward, behind the handy Quick windlass, there’s a separate sail locker under the deck, with just enough room to stow two large sails neatly flaked down in bags. The biggest change here is that the nav station, which was largely vestigial and awkwardly placed on the old 45, has been removed, and instead the saloon table has been equipped with twin nav desk drawers, so that it can be used for studying charts and such. 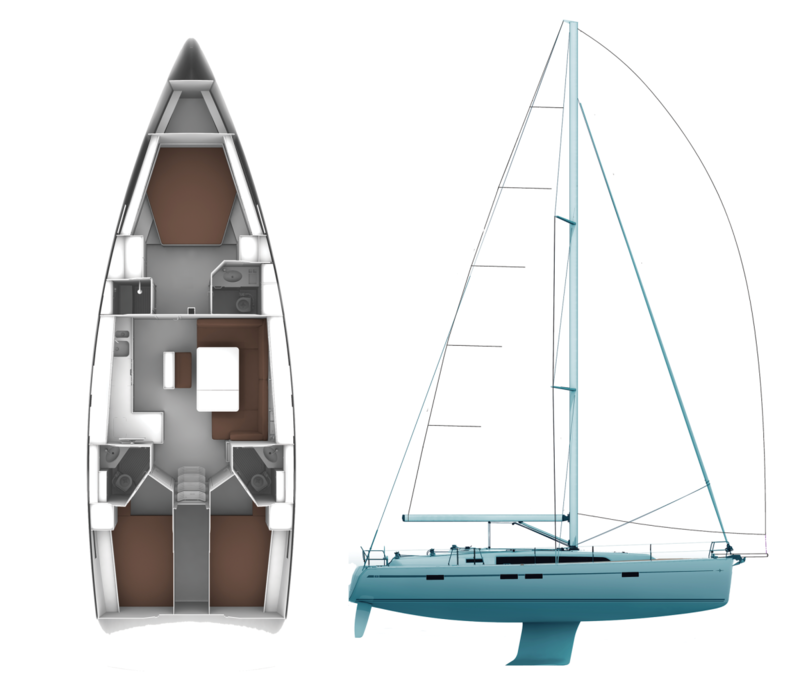 There is also now an optional centerline island with a fold-down settee seat that sits between the saloon table and the in-line galley that stretches along the port side of the boat. The fold-down seat is not terribly comfortable, but the island provides great support for a cook working in a seaway and includes a number of useful and easily accessible storage spaces. The galley itself has copious amounts of counter space, thanks in part to a front-loading Waeco refrigerator, and all horizontal surfaces have nice deep fiddles to keep things in place. The three-burner Techimplex stove is directly opposite the island, so you can brace against it while cooking. Our test boat was also equipped with a handy top-loading Isotherm fridge/freezer. As on the old boat, there is an enormous master stateroom forward with an en suite head and a dedicated shower in its own separate mini-cabin. The stateroom, if desired, can be split into two much smaller double staterooms by installing a removable centerline bulkhead, a feature, I suspect, that will appeal only to charter-fleet operators. The twin aft staterooms, each with its own head, are among the best I’ve seen anywhere. There’s lots of headroom, the berths are large and comfortable, and there’s plenty of ambient light. Ventilation, as is often the case in this part of a boat, remains a challenge: a good argument for ordering the optional 29,000 BTU air conditioner. Our test boat came equipped with a slightly fractional Seldén rig with an in-mast mainsail furling system and a Furlex 304S furler for the 110 percent jib forward. The standard sails are by Elvstrom. The shrouds are anchored outboard near the gunwales, so flying a large overlapping genoa is pretty much out of the question. To keep going in light air, you would be well advised to pony up for the optional gennaker. Our boat had never been sailed before the day of our test, having just arrived from the factory, and we spent a lot of time getting the sails to set properly. Once dialed in, however, the boat performed well in the 15 to 17 knots of true wind we enjoyed on Chesapeake Bay that day. Our maximum boat speed was 8.5 knots clocked at a 60-degree apparent wind angle, which compared well to the 9.3 knots I made at the same angle on the old 45 off Grenada in 20 knots of breeze. That 45 was very well prepared, with a standard slab-reefed mainsail, and could comfortably point as high as 35 degrees. On this less-well-prepared boat, with a furling mainsail, the best we could manage was 40 degrees. Helm response, experienced via the twin-wheel Jefa steering system, was excellent. The boat is extremely wide aft, but is equipped with twin rudders, so it’s easy to control even when well heeled. The steering groove is not that wide, so you can’t get too distracted, but careful attention to the wheel is amply rewarded. Our boat carried the optional 75hp Volvo diesel with a saildrive leg (the standard plant is 55hp) and made excellent progress under power. Maintaining a tempo of 2,200 rpm we hit 7.8 knots in mildly lumpy conditions. At full throttle (2,800 rpm) we made 8.8 knots. The boat turned smartly at speed in just one boat length and was easy to control backing down. The engine itself should be easy to work on. The engine compartment is very tall, with excellent access from the front and reasonable access from the sides. Bavaria has done a good job here refining and improving what was already a very good mass-production cruising boat. In terms of space and comfort, the Cruiser 46’s interior accommodations are equal to any of its competitors. In terms of performance, if set up properly, it is a superior vessel.